Without a shadow of doubt the most difficult hole on the course. From a tree lined tee the shot is hit into the very open yonder, the fairway dropping down towards the more level ground in the distance. Hazards for the tee shot are the trees on the right and the tree line down the left just beyond the out of bounds trench. A fairway bunker awaits the longer tee shot hit off line to the right. 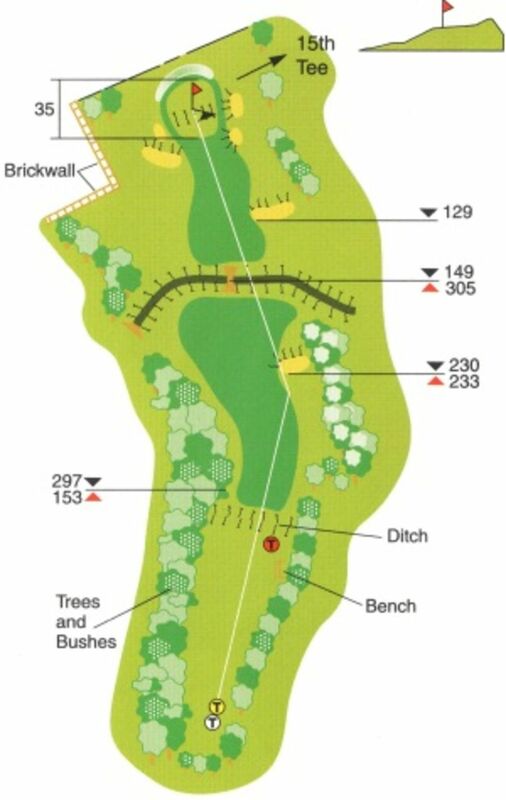 The second shot is determined by the position of the tee shot, influenced by the stream that runs across the fairway. Lay up or go for the green? Just beyond the stream is a bunker that makes any shot to the green from there virtually impossible. There are a couple of bunkers short of the green both left and right, that make the approach more daunting. The green is a typical two-tier design, with a fairly steep gradient slope up to the top tier. The slope comes into play in all but front pin positions. The are two greenside bunkers left and right, as well as a small but steep bank on the right hand side back portion of the green.